Your hearing is precious and should be treated with the utmost respect to ensure a long and healthy lifespan. In the past, ear protection has been cumbersome and lessened your enjoyment of the full audio spectrum. Today however, new technologies have been developed that means you get the same, open sound and maximum comfort - all whilst protecting your ear drums. Here, we present to you the winners of the Red Dot awards for innovative ability, the Alpine MusicSafe Pro Ear Plugs. Ok, we get it... Being sensible isn't exactly rock and roll but what good is rock and roll when you can't hear it? The safe audible pressure level for our ears is up to 80dB. In comparison, your favourite band may kick out up to 120dB at a gig which will punish your eardrums. The Alpine MusicSafe Pro Ear Plugs will reduce this back to a safe level and will do so without cutting out any frequencies. This is largely thanks to the specially developed Alpinethermoshape material that lets your ears "breathe" and thus prevents that "blocked in" feeling that you can get from plain earplugs. For musicians, with the Alpine MusicSafe Pro Ear Plugs you can go and be friends with your drummer again or even stand next to your guitarists amplifier whilst they have it all the way up to 11. No more tinnitus and no more discomfort, just the full clarity of your chosen audio source at a safe level. The Alpine MusicSafe Pro Ear Plugs can be re-used and are easily cleanable with a little soap and some luke-warm water. They are also supplied with 3 interchangeable acoustic filters to get the perfect fit for your ear canal, a strap to hold the pair together and a spare ear-plug. All of this comes in a neat little case which you can personalise too. This is one little investment that could save you a lot of earache, literally! 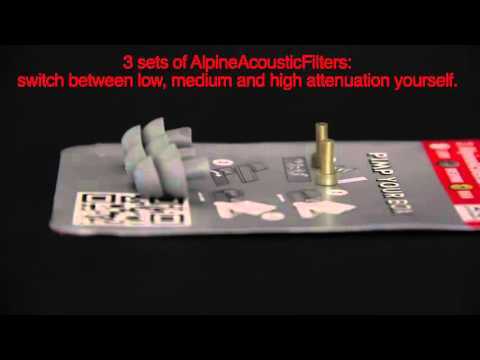 The Alpine MusicSafe Pro Ear Plugs are your ticket to total enjoyment of live music, all whilst basking in the knowledge that your ears are as safe as can be.